By Megan Coward Graduate Jeweler Gemologist, G.I.A. Halo rings are among the most popular styles for an engagement. These rings are done in elegant designs that use a ring of diamonds to surround the center stone. This unique choice of ring is eye-catching and perfect for any bride-to-be. Halo rings come in a variety of stunning styles. From single center stone designs to more elaborate three-stone styles, there are designs for any budget or taste. This ring choice is also great for those looking to make the center stone appear larger than it really is, as the style gives the illusion of a bigger diamond. Rings can be done with a round diamond center that is set inside a circle of pavé set diamonds. This graceful design is classic yet unique. Coast has created a halo style mounting with round diamonds totaling .30 carats, available in 14k and 18k white, yellow, or rose gold. The side view shows a lovely curved design with a diamond hidden in the center. With this ring, the mounting is sold separately from the main center diamond, and you can choose a center diamond up to 6.7 millimeters in size. This mounting starts at just over $2,000. Littman Jewelers features a halo style engagement ring with a round center diamond and diamonds along the ring shank for .50 carat total weight of diamonds. The ring is in 14k white gold. Be sure to order the correct ring size because resizing is not recommended. The ring retails for around $800. For those looking for a twist on the traditional princess cut diamond engagement ring, consider a square halo. 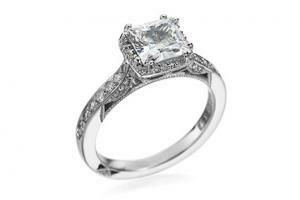 This style uses a princess cut center that is completely encircled by diamonds. This Tacori square princess halo ring features intricate detailing and pave set diamond accents. Diamonds in the mounting total .35 carats. The diamond weight will vary according to the size of the ring, and because the center diamond is sold separately. Once you decide on the mounting, you can then add the focal point diamond to match. This mounting retails for just over $5,000. The Kirk Kara 18k White Gold Diamond Engagement Ring includes beautiful rows of diamonds and pretty detailing. There is also a matching wedding band available, sold separately, should you want to purchase the set. The mounting has diamonds totaling 3/8 carats. The diamond weight will vary according to the size of the center diamond, which is also sold separately, and the ring size. The mounting is available for just over $3,000. Kay Jewelers features a halo style engagement ring with a princess cut center diamond. The split style shank is also accented with diamonds and the engagement ring comes with a matching wedding band also containing diamonds. The diamond weight of the engagement ring and the wedding band totals .50 carats. The total carat weight may vary based on the ring size. The set is in 14k white gold and priced at almost $1,100. What's better than a single halo of stones around a diamond? Two halos of stones, of course. 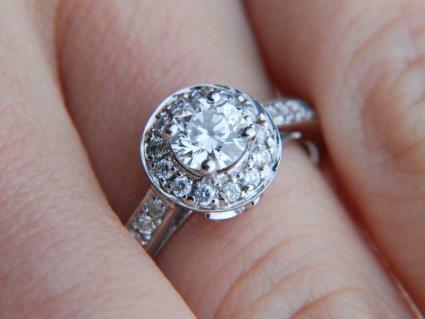 Instead of a halo of stones surrounding the center of the ring, two halos of diamonds can be used. The double halo style ring by designer Neil Lane is set in 14K white gold and has a vintage feel. It has two halos of diamonds encircling the 1/2 carat oval-shaped diamond and additional diamonds along the shank of the ring. It also comes with a matching wedding band which adds another row of diamonds. The set retails for around $4,500. Designer Suns and Roses has created a double halo engagement ring in rose gold, which is a lovely color that offsets the diamonds. The two halos encircle the center round diamond, which is sold separately, with .50 carat total weight of diamonds set along the shank of the ring. The mounting retails for around $2,000 and the center diamond is sold separately. For a different look, try this engagement ring in the double halo style that features a round diamond in the center, which is included. There are diamonds accenting the swirled shank for a total diamond weight of .30 carats. The ring is offered in 10k white gold and retails for around $600. The Emerald-Cut Diamond Three-Stone Halo Ring is a stunner, with round diamonds surrounding each of the three larger stones. The ring also features diamonds accenting the shank of the ring for 1.42 total carats of diamonds. The ring is available in 14k white gold. The center diamond as well as the accompanying diamonds are included in the retail price which is around $6,000.Three stone rings are a great choice for engagements as well as anniversaries. They represent the present, past and future. Halo designs are popular for three-diamond rings as well. Three diamonds are used in the ring along with halos around each of the diamonds or with a halo around only the center diamond. This style has a vintage look and sophisticated design. Reeds Jewelers features a three diamond ring by designer Ritani with round diamonds, each surrounded by halos. The ring also features .74 total carats of diamonds accenting the shank of the ring. The ring is available in 14k white gold but the designer also works with platinum, which is available by special order. The ring retails for under $4,000. This 10k white gold ring has three round diamonds surrounded by halos or smaller round diamonds. The ring also features diamond accenting on the shank. The diamonds total .50 carats. You can pick it up for just over $900. Halo rings are a favorite choice for many potential brides. This sparkling style ring is a classic, yet has a twist on tradition. Most halo rings are set in white metal to enhance the diamonds and make the ring stand out. This style ring is appealing to those who want a retro look with a modern twist.